It’s that time of the year once again in the United States: absentee ballots are rolling in and voters are preparing to go to the polls. Some of us, even 20-somethings like me who are new to the grind, take participation in the democratic process for granted. As a child, I made the trek with my parents to our polling place every year, filled with an overwhelming sense of pride when they let me wear the “I Voted” pin. In my eyes, voting was just something that adults did – it was never more complicated than that. Voting is a right that all of-age citizens are supposed to enjoy, thanks to the fundamental human right of “universal and equal suffrage.” Recently, however, I began to realize that suffrage is neither universal nor equal in the United States. A few weeks ago at a phone banking event, I spoke with a man who is forbidden from voting for another 10 years because he is currently on parole. This man committed a felony decades ago, served his time, and yet remains deprived of his civil rights. Minnesota law restricts “any individual convicted of treason or any felony whose civil rights have not been restored” from voting. The law restores civil rights upon “discharge” of the conviction, but that doesn’t happen until probation or parole has ended. The result: 75 percent of the 63,000 Minnesotans who were unable to vote due to a conviction in 2011 were living in the community on probation or parole. Felon disenfranchisement laws vary around the country. Two states, Maine and Vermont, have no restrictions, allowing people on probation, parole, and in prison to vote. Maine and Vermont share the approach of many democracies around the world. Minnesota, by contrast, stands with Armenia and Chile in banning people from voting even after release from prison. Compounding the injustice, as a result of racial disparities in contact with the criminal justice system, Minnesota’s policy of disenfranchisement disproportionately strips African Americans and American Indians of the right to vote, violating U.S. obligations under article 5 of the Convention on the Elimination of All Forms of Racial Discrimination  and article 25 of the Covenant on Civil and Political Rights, which guarantees the right to vote free from discrimination based on race, color, language, or other status. The numbers are sobering. According to the Restore the Vote coalition, African Americans, roughly five percent of the state’s population, made up 25 percent of those disenfranchised in 2011; American Indians, two percent of Minnesota’s population, represented six percent of those disenfranchised. The impact may be long-term: that “I Voted” pin helped introduce me to the importance of voting; kids whose parents are denied the right to vote are shut out of that introduction to the democratic process. The Advocates for Human Rights is part of Minnesota’s Restore the Vote coalition, an alliance of almost 100 groups working to change Minnesota’s policy on disenfranchisement. For more than 10 years, the coalition, led in part by disenfranchised community members, has pushed for the reinstatement of voting rights for those living in Minnesota. This coalition is advocating for a human right that too many of us fail to appreciate. As Election Day approaches, consider what is at stake if Minnesota continues to deny the fundamental human right to vote to thousands of our neighbors. Perhaps this will motivate each of us to strive for a more just democracy for ourselves and our kids. By: Ellie Benson, a student at Macalester College in Saint Paul, Minnesota, and a research intern at The Advocates for Human Rights. I am constantly amazed at the accomplishments and bravery of kids my age. Many confront issues that I simply do not have to take on—often with respect to very basic things. I hope that if I was confronted with the same situations, I would be as brave. Parkriti Kandel from Katmandu, Nepal is one such teenager. Throughout her life, she has been forced to live and struggle with the “menstrual taboos” in her culture. At a listening party for 15-year-old girls hosted by NPR, I heard Prakriti’s story and her efforts to mitigate the menstrual taboos in her country and, in spite of it, her struggles to achieve her dreams. “When I’m having my period, I can’t touch my grandmother, and I can’t eat while she’s eating,” Prakriti told NPR. “I can’t touch the table while she’s eating. I can’t touch my father; I can’t touch my mother.” Prakriti was even blamed for her father’s illness because she had touched him while she had her period. “Because of this belief [the belief that women are infectious on their periods], because of this ritual, women are not equal to men,” she said. Her goal in life “is to be the prime minister of Nepal and change things” regarding menstrual taboos. There is a certain shame that I feel when I hear girls talk about their periods. I have had a difficult time talking about it, too. Why do I feel this shame? It is a normal bodily function. Why do negative stigmas surround it? As Prakriti noted, “discrimination always hurts.” For example, blaming a woman for being moody is a discriminatory menstrual taboo wrongly suggesting women cannot consistently operate as rationally as men. And at the Olympics in Rio, when the Chinese female swimmer, Fu Yuanhui, mentioned to a reporter that she was experiencing her period, she made international headlines for breaking a Chinese menstrual taboo. The negative connotations associated with a woman’s period must end. I hope by drawing more attention to this issue, I will help others feel comfortable talking about their periods and the taboos we experience. Yuanhui broke the silence, and it is time we do, too. Death Penalty Under Scrutiny: Is State-Sanctioned Murder Constitutional? On Monday, October 10, the 14th World Day Against the Death Penalty will raise awareness of the application of the death penalty for terrorism-related offenses with the goal of reducing the use of the death penalty. The United States and 64 other countries allow people to be sentenced to death for terrorism-related offenses. The Advocates for Human Rights, with the assistance of pro bono attorneys, collaborates with members of the World Coalition Against the Death Penalty to bring death penalty issues to the attention of the United Nations to advocate for change. Jury selection began last week in the case of Dylann Roof, the self-identified white supremacist accused of murdering nine black worshippers at Emanuel A.M.E. Church in South Carolina last year. Roof was recently denied the opportunity to plead guilty and serve a life sentence for his crimes; the Department of Justice will instead seek the death penalty. In response, Roof’s lawyers have chosen to challenge the constitutionality of capital punishment head-on. Their decision to oppose the death penalty in court, citing the punishment as “a legally prohibited, arbitrary, cruel and unusual punishment prohibited by both the Fifth and Eighth Amendments,” follows the lead of similar influential cases that have taken place across the country in the past several years. 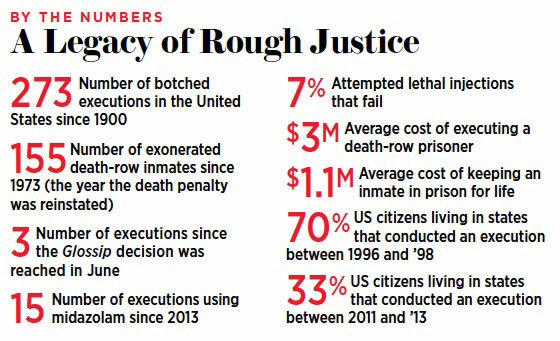 In the United States, the federal government has not carried out a death sentence in over a decade. The Death Penalty Information Center reports 2015 as having the lowest recorded number of executions in 25 years (28 people), as well as the lowest number of death sentence convictions in over 40 years (49 people). At the same time, public opposition to the death penalty is at the highest level it has been in several decades, marking steady progress toward abolition of the death penalty. From the grass roots to the U.S. Supreme Court, individuals have increasingly vocalized disdain for the death penalty. The Black Lives Matter movement has recognized diminished public support for capital punishment and in its policy platform is demanding immediate action toward complete abolition. In response to the U.S. Supreme Court’s decision allowing states to continue to use the drug midazolam in executions, Justice Stephen G. Breyer authored a 46-page dissent, arguing that “it is highly likely that the death penalty violates the Eighth Amendment’s prohibition against cruel and unusual punishment].” The drug itself is linked to causing severe pain in the process of an execution, a point which prompted some Justices to question the constitutionality of the death sentence. In his dissent, Justice Breyer noted several flaws in the system of administering capital punishment: the execution of innocent people; frequently exonerations of individuals on death row; and the negative influence of politics and discrimination on the imposition of the death penalty in the criminal justice system. Seven states have abolished the death penalty since 2007, bringing the current total to 20. (Californians will vote on November 8 to determine whether that state will join the list.) The most recent is Delaware, when its Supreme Court ruled that the state’s statute allowing judges to overrule a jury’s decision for a life sentence was a direct violation of the Sixth Amendment of the Constitution (the right to an impartial jury). In January of this year, the Supreme Court ruled similarly on Florida’s death penalty law. State by state, courts are ruling that major faults in our system of justice are in direct violation of basic rights recognized in the U.S. Constitution. Dylann Roof must answer for his shocking crimes, and for the permanent damage he has inflicted on his victims and their families. We must recognize the powerful racial dynamics at work, acknowledging Roof’s racially based murders and his privileged status as a young white male in today’s criminal justice system. Yet, we should also recognize the significance of Roof’s lawyers challenging the constitutionality of the death penalty on a federal level. If the court decides that the death penalty violates the Constitution, not only will it mark significant progress toward ending state-sponsored murder, but our country may also find the motivation and political will to reform of a criminal justice system in desperate need of justice, and to bring that system in line with international human rights standards. By Maggie Poulos, a student at Macalester College in Saint Paul, Minnesota, majoring in International Studies with a minor in political science. During the summer of 2016, she was an intern with The Advocates’ International Justice Program. She is interning with The Advocates’ Refugee & Immigrant Program during the academic year. Click here to learn more about The Advocates for Human Rights’ work against the death penalty.